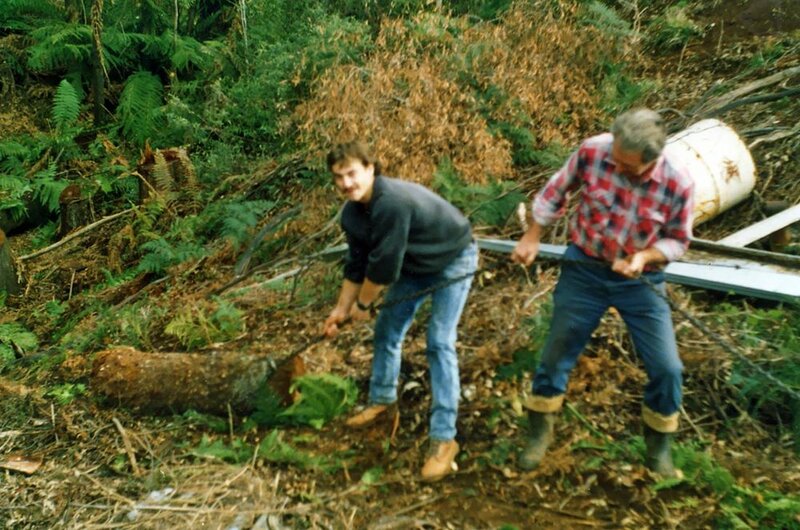 The Emu Valley Rhododendron Garden was conceived by three men and their passion for the genus Rhododendron in 1981. Hilary O'Rourke, the landowner and rhododendron breeder, Noel Sullivan, the learned expert and teacher, and Bob Malone, the talented breeder and nurseryman, discovered their shared interest in rhododendron culture and from it arose the concept of the garden. The site was a scrub and blackberry infested hillside and the concept needed imagination and vision, to see the potential of the world standard garden it has become. Emu Valley Rhododendron Garden (EVRG) was established by members of the Australian Rhododendron Society, North West Tasmanian Branch, which later became Emu Valley Rhododendron Society. This Branch of the Society was closed in July 2011 when the Garden was transferred to the incorporated body of EVRG. An independent non-profit organisation, development has been achieved through voluntary effort by members. EVRG is a private garden, owned by it’s members, which has acquired significant international acclaim in recent years. The garden is divided and space allocated to each part of the world in which rhododendrons grow in the wild, and each was named accordingly. Plants which originated anywhere from the icy Himalayas to tropical New Guinea and across the Pacific to the Americas adapt willingly to their new hillside home. Subject to seasonal variations, the huge large-leafed rhododendrons flower during August and September. This is followed by the main flowering period which peaks in mid October and finishes in December. Vireya rhododendrons flower all year. Autumn colours shown by the deciduous companion plants are spectacular during April and May. The Garden is open 9.00am - 5.00pm daily except for Christmas day and Good Friday. Accompanied children are admitted free of charge. The Emu Valley Rhododendron Garden as it is today- a haven, a refuge, an adventure land, a woodland delight, a kaleidoscope of colour in spring and again in autumn, a cool green oasis in summer, a bird watcher’s delight, brisk exercise for the heart and lungs, solace for the soul, a travelogue, a learning experience – so many different and varied experiences in one small garden.